diy | Live more lovely. life's the school, love's the lesson. 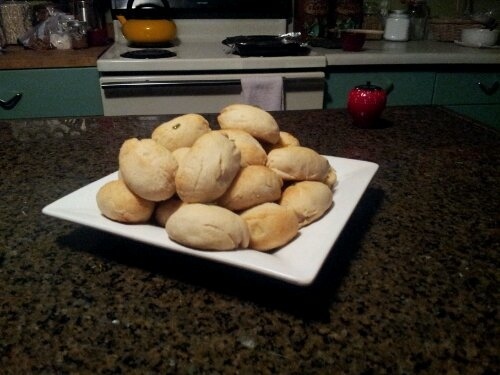 Homemade Texas Style Kolaches in 10 Steps. I usually like to keep things simple in the kitchen, but as a displaced Texan, let me tell you… Your efforts will be worth it for these babies. 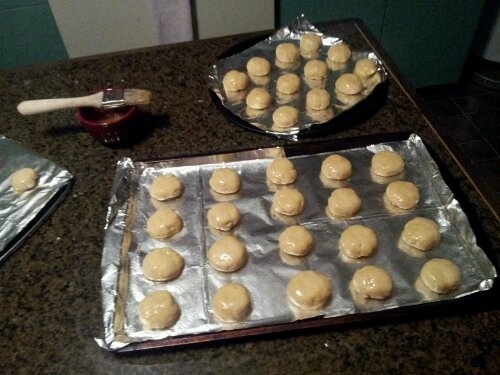 I made a huge batch last night and stuck ’em in the freezer. This morning I woke up and popped two in the microwave for about 45 seconds, YUM. 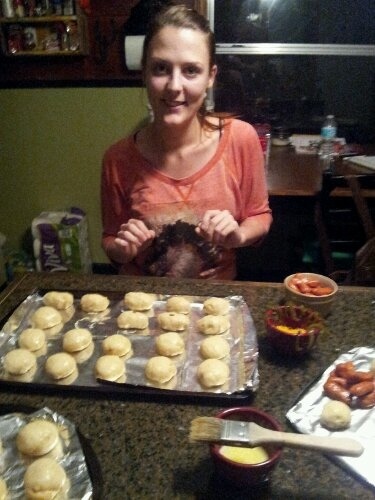 The smell of fresh kolaches in my floridian kitchen was priceless. 1. 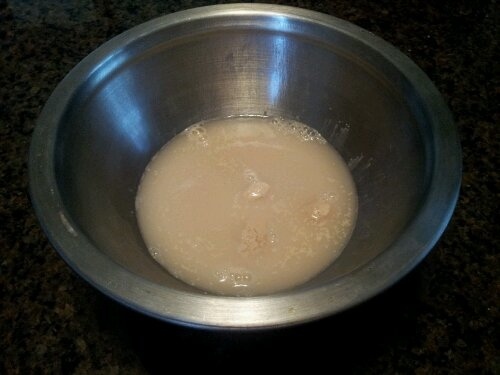 Combine water & yeast in small bowl, set aside. 2. 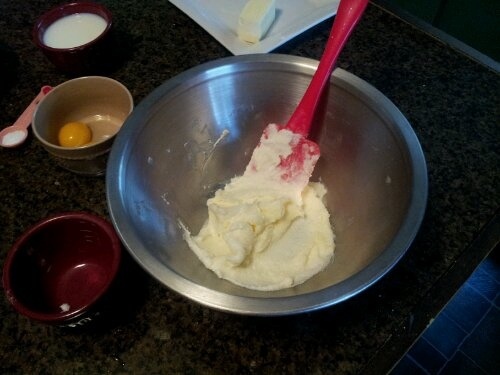 In a large bowl, cream together butter, shortening, and sugar until light & fluffy. 4. Add the water/yeast & flour to the mixture. Stir until a soft dough is formed. 5. 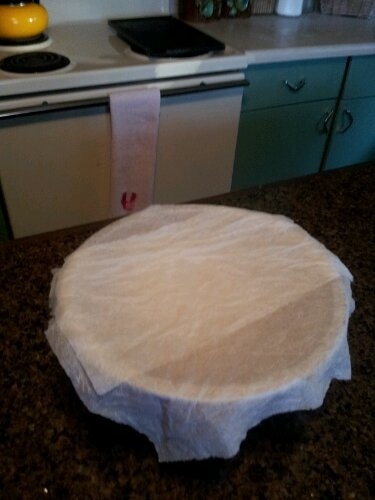 Cover the dough with a towel and let it sit for about an hour and a half. 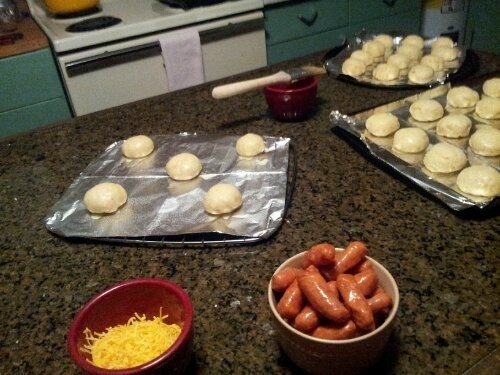 Save yourself some heartache and spend this time cleaning up your mess from phase one of operation kolache. 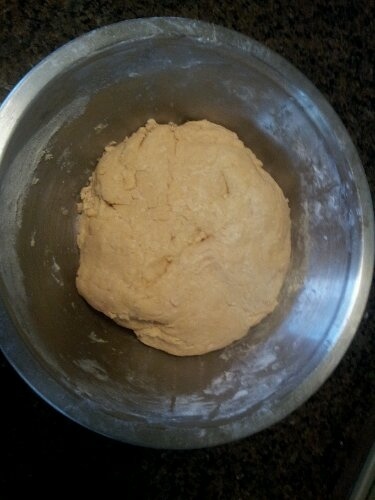 6. pull off pieces of dough (think a little larger than a golf ball) roll them up, and flatten slightly. 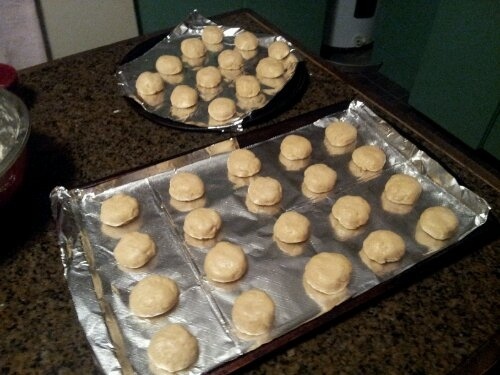 Place them on a greased baking sheet. 7. 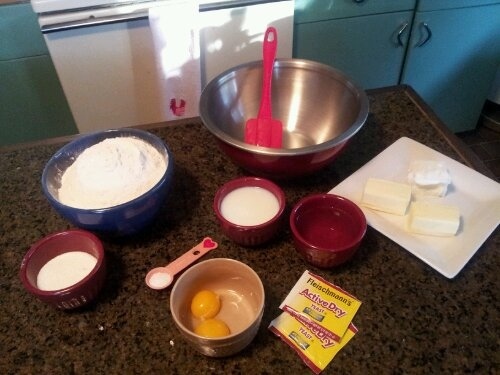 Arrange the dough balls at least an inch apart from each other, and brush them with melted butter. Leave em alone for another hour to double in size again. 8. Now it’s time to pull out your sausages, cheese, and jalapenos! Using your pinky finger, drill a hole into a piece of dough. If you have tiny fingers like me, you may need to wiggle it around to make room for your fillings. My technique got better as I went along. (A. Drill a hole B. Throw some cheese in it. C. Add a piece or two of jalapeno D. Toss a sausage in & pinch it closed!) 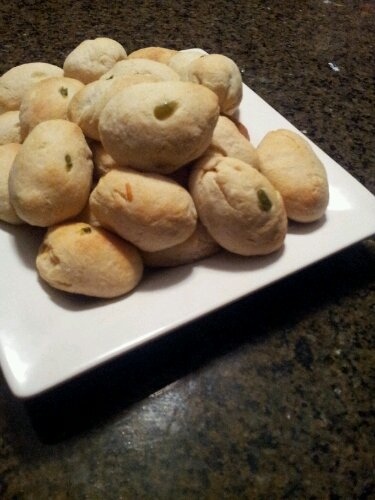 I made a few with jalapeno & a few plain. It’s easy to mark the top of your spicy ones with a tiny little piece of jalapeno on top. That’s the way I’ve always seen the donut shops do it! This part is time consuming, but also fun in a ‘get your hands dirty’ ‘play-doh kitchen’ sort of way. Have fun & enjoy the process. 9. When you’re done constructing your kolache babies, throw them in a 400 degree oven for 10-12 minutes or until golden brown. 10. 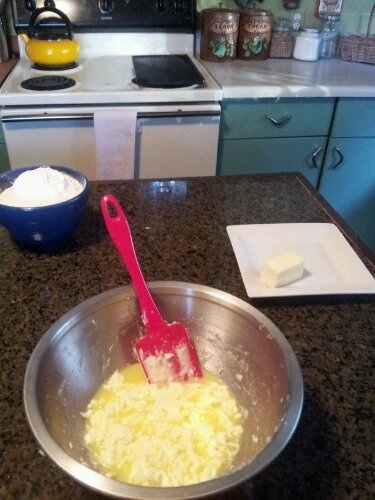 Immediately brush the tops with melted butter. Let cool & ENJOY, Y’ALL!!! *Don’t forget they freeze & reheat really well. I’m looking forward to several no cook comfort food breakfasts in the upcoming weeks. Mmm mmm! I woke up this morning just itching to continue on with my hoop project. I was unable to return my wonky tubing to the irrigation supply store where I bought it. bummer! 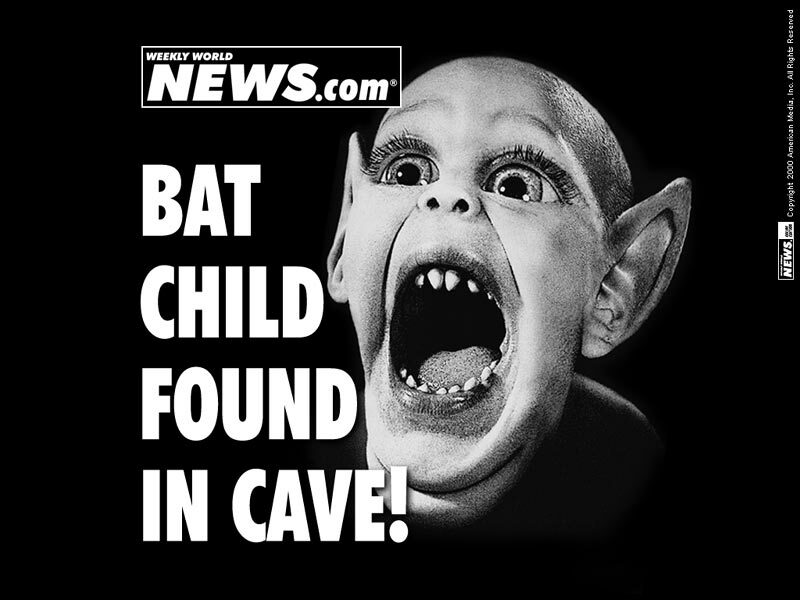 Thankfully though, today at Lowes, I was able to speak with someone who KNEW what I was looking for. I bought a second hundred feet of the tubing I was actually after & got started. First and foremost, let me say – I was so happy to have a pvc pipe cutter on hand. I can’t imagine how difficult (& time consuming) it must be without one. Inserting the connectors took some muscle this time around too. The newer tubing was much stiffer than what I had bought yesterday. I used my hair dryer to heat up the ends before pushing in the inserts, but it was still tough. After I finished a few, I started to pick up speed & before I knew it I had ten naked hoops. The taping is what takes time. I thought it would be simple, but it’s surprisingly challenging to lay it down evenly. It’s definitely something I will need to get better at. ha! Hats off to the ladies and gents who can lay it down with ease. I salute you. So far, I’ve successfully completed one hoop. I would probably have a couple more, but I kept taking breaks to enjoy my new audiobook – “Spirit Junkie” by Gabrielle Bernstein! By the way, I LOVE it. For the hoop I finished, I decided to use strips of green floral fabric to add grip in place of gaffer tape. I’m really happy with how it turned out! I got the idea from a video on youtube, you can check it out HERE. She suggests using painters tape to hold the strips in place as you work, but I actually sprayed my strips with Aleene’s Crystal Clear Acid Free Tacky Spray. It comes in an aerosol can & is extremely easy to use. I used orange & green electrical tape to spiral around with the fabric & the effect is adorable! I know this hoop is going to make somebody very happy! I also heard back from Hoopnotica again, I’m on cloud 9! They confirmed that they will be holding a certification training at my home-away-from-home yoga studio, early next year! The training will be in March & I will be getting certified in levels 1 & 2. I am absolutely ecstatic! I can’t wait to teach! I have so much fun sharing my passion for hooping. This training will help me learn how to break down moves and explain in it ways everyone can understand. I really am bursting with excitement to join the Hoopnotica family & get licensed! All day long it has been hoops, hoops, hoops, but the sad part is I haven’t hooped at all! That being said, I’m going to run outside and twirl with the little sunlight I have left. This morning I woke up with a mission. I decided it was time to start making some hoops! After calling around to a few different places and doing a little research online, I decided on an irrigation supply store near my house. On the phone, the woman sounded confident that she had exactly what I was looking for (100PSI 3/4′ poly tubing). Turns out, she didn’t really know what kind of tubing she had. She did know that it was 3/4′ and she had the connectors. I had a hair to build some hoops, so I went ahead and bought 100 Ft. & headed out in search of tapes. The local hardware store had “no idea” what gaffer tape was and only black electrical tape. Lowes didn’t carry (or know about) gaffer tape, but did have an array of colored electrical tapes & something called ‘friction tape’ in black. It was wrapped up in plastic so I couldn’t really tell what it felt like. I bought a roll, but haven’t opened up to experiment yet. Actually, I haven’t opened up any of my beautiful bright new tapes, because the tubing I bought makes awful hoops. ha! They’re wobbly and flimsy and just plain goofy! I tried to add some weight by adding some water to one, but it just made it even more silly. A great workout, but silly. My boyfriend was watching me try it out in the yard tonight and suggested I try to market it as a “wonky hoop”. I think I’ll try to return what I haven’t cut and if that’s not an option, just make some smaller sizes for hand hooping. Hopefully, tomorrow I can find some better tubing & actually tape one up! The taping part sounds like the fun part. While testing out my ‘wonky hoop’, I also spent some time working on double shoulder duckouts with my go to hoop and actually pulled the trick off a few times! That’s big news for me, because I’ve been attempting for days with no luck. Single shoulder duck outs, no problem. Doubles, though, doubles are hellish for me! At least now I can really say it’s a trick I’m working on, rather than attempting. Finally! I jammed my finger out there too. It’s bruising and a little swollen, but I’m so thrilled about “landing” my trick, it feels totally worth it. The price I pay for double shoulder duck outs! A little more good news: one of my hooping videos was accepted by dube juggling, so I got a code for 20% my next purchase! woo! I made a special halloween video that was featured on hooping.org a couple of days ago too. (= Check it out HERE. We didn’t do much for Halloween today, but we celebrated all week and weekend, so I don’t feel like I missed out. I listened to a little Halloween music, but spent most of my time at the yoga studio. I didn’t put my costume on, but I’m still in the spirit!